I recently viewed an exhibit about the Hubble Space Telescope at the S.C. State Museum. I've always been fascinated with astronomy, physics, and science in general. To be honest, though, I found the exhibit shallow and disappointing; however, the exhibit did impress upon me, once again, the sheer enormity of space. "Yeah, yeah, yeah", you're thinking, "we all know space is big. DUH!" And you're right. Everyone does know the distances are huge, but I don't think they really comprehend the size. For instance, Alpha Centauri is the nearest neighboring star to our Sun at only 4.3 light years away. Only 4.3 light years equates to 25,265,838,509,316.77 miles! That's 25 trillion miles! Then again, somehow the concept of a trillion doesn't convey the magnitude (pun intended) of the number. Imagine a stack of paper 25 trillion sheets high. Any idea how tall that stack would be? A sheet of standard copier paper is 0.0038" thick so a stack of 25 trillion sheets would be 1,499,368 miles high -- or a little over 6 times the distance to the moon! As I said, it's 25 trillion miles (4.3 light years) to the nearest star other than the Sun, but this is a mere speck compared to the size of our galaxy. The Milky Way is 100,000 light years in diameter, over 23,000 times the distance from the Sun to Alpha Centauri -- 587,577,639,751,552,790 miles. Now that corresponding stack of paper is 34,485,464,000 (34 billion) miles high, roughly 7.5 times the radius of our solar system! The farthest astronomical object yet discovered is a galaxy estimated to be 13 billion light years distant. That distance is 130,000 times greater than the diameter of the Milky Way. Now the corresponding stack of paper is 4,483,110,320,000,000 miles high -- over 177 times the distance to Alpha Centauri! It's not just distances that are mind-boggling. 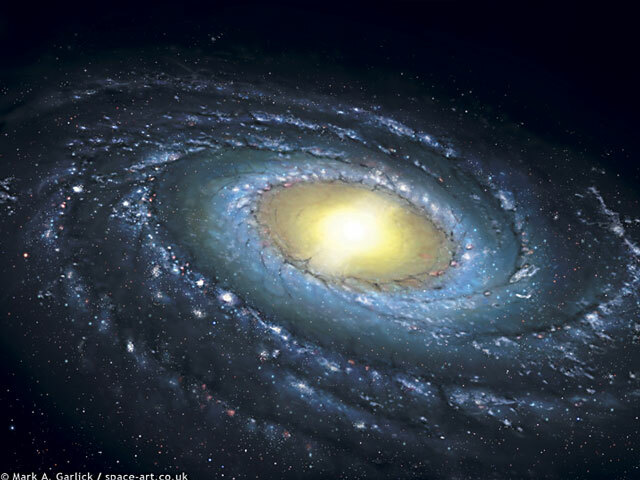 It's estimated that the Milky Way contains 200 billion stars. And the Milky Way is just one of an estimated 125 billion galaxies! In all, the estimated number of stars in the known universe is 1021 -- that's 1,000,000,000,000,000,000,000 stars. Interestingly, depending on whose estimate you use, that's roughly equivalent to the number of grains of sand on Earth.